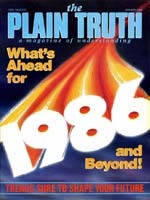 IT IS time — beginning with a new year — that the readers of The Plain Truth focus attention on the major trends now bringing this world's society to a catastrophic climax — just before the ushering in of the peaceful world tomorrow. "For nation will rise against nation, and kingdom against kingdom." He also said, "And there will be famines, pestilences, and earthquakes in various places." Foreseeing today's growing social evils, he said in Matthew 24:12, "... because lawlessness will abound, the love of many will grow cold" (Revised Authorized Version throughout). Let's look at these conditions. Warfare. Around the globe, nations and conflicting forces within nations are locked in deadly struggles for power. More than 140 serious armed conflicts have occurred since 1945. Many of these have their origins in the intractable East-West ideological clash. Communal strife further threatens to rip asunder key multiethnic countries such as South Africa, Sri Lanka and India. The continent of Africa, said one observer, is "near a state of decomposition." Religious conflicts, the anathemas of ages past, are rearing their ugly forms once again. Militant Islam is again a force to be reckoned with. Marxist persecution of religious bodies is growing in Ethiopia. And in Israel a surging militant extremism is steadily gaining strength, battling for the soul of Israel. Even in Europe, Moscow's grip on its satellite nations is threatened by renewed religious fervor. As in the days of Noah (Gen. 6:5), evil acts and violence fill the earth — another sign that the greatest prophet of all, Jesus Christ, said would characterize the end time (Matt. 24:37-38). It was then — and again is — a time, paradoxically combining appalling world evils with "eating and drinking, marrying and giving in marriage" (marriage and divorce) — the "good life," as some would call it. Famines. Deaths from malnutrition and hunger on a •wide scale, Jesus warned, also would characterize the end of this civilization. Famines as a result of droughts and downturns in the weather cycle have afflicted mankind periodically throughout history, but appalling conditions prevailing in Africa illustrate that there are political reasons for famines, as well as for the farm price collapse in prosperous North America. Before independence, the African continent was a net food exporter; now it is dangerously dependent upon food imports from a handful of as — yet abundant producers. Land abuse, deforestation, governmental neglect of agriculture in favor of the urban masses (who are easier to control politically) , mismanaged collectivized farming, and, of course, civil unrest have brought millions of Africans to the brink of starvation. Emergency aid from the developed world amounts to a mere pittance of what is needed — and does nothing to change the structural causes of famine. There is "no hope for Africa," confesses one African diplomat, unless these root causes are tackled. Pestilences. Extreme famines naturally lead to pestilences. But there can be other causes for disease plagues as well. One cause is "lawlessness" or "wickedness" out-of-favor biblical terms that describe wholesale disobedience to the law of God. The tireless efforts of the scientific community have eliminated or greatly curbed some plagues of the past, such as smallpox. But new plagues are exploding in many developed countries: specifically a whole host of sexually transmitted diseases. The most deadly of these is AIDS, or Acquired Immune Deficiency Syndrome. Present attitudes toward this dangerous, almost inevitably fatal syndrome will guarantee its further spread. In the United States, for example, the number of AIDS cases doubles every ten months. Of those who have acquired it, half have already died. The reservoir of those possessing the virus, but not yet showing symptoms, may be as high as one million. These people are capable of infecting others. Homosexual males comprise the largest segment of AIDS victims and carriers, intravenous drug users a distant second. Exerting political pressure, "gay rights" organizations warn that efforts to curtail this end-time plague must not come at the expense of their "civil rights." The age-old tool of quarantine should not be used, the public is told, lest victims be treated as "lepers." Some unmuzzled experts are gravely concerned over public health and the need to give priority to the "common good." Warns one: "AIDS is not about civil rights, political power, or 'alternative life styles.' It's a disease. A true plague. Further, this disease is only partly understood, is at present untreatable and is invariably fatal.... Caution would seem to be in order when it comes to exposing the public.... "
The AIDS outbreak — which is certain to spread — is a graphic illustration of Jesus' words: "And because lawlessness will abound, the love of many will grow cold." Lawlessness in sexual relations (Lev. 18:22) is spreading this plague! And the lack of love — true concern for the welfare of others frustrates attempts to control it. Wars, insurrections, religious and racial hostility, famines and pestilences dominate today's headlines along with earthquakes and other natural disasters, often aggravated by the works of man. They will continue to do so until the return of Jesus Christ. Tragically, the world at large cannot see the "big picture" any more than those living in Noah's day could (Matt. 24:39). The vast majority "have eyes and see not" (Jer. 5:21). Hopefully, readers of The Plain Truth have their eyes open!